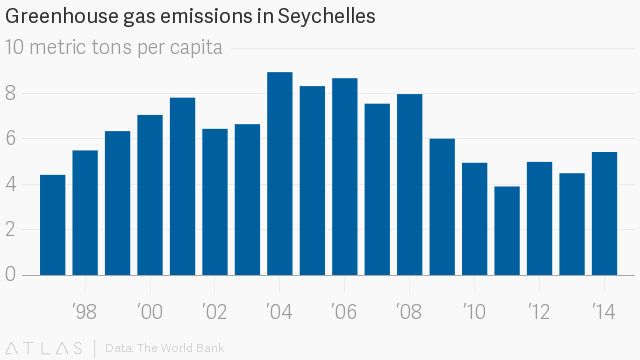 In what is being hailed as a global first, Seychelles has agreed to swap parts of its debt in return for designating nearly a third of its waters as protected areas. The island nation will secure roughly 210,000 square kilometers (81,000 square miles) at the Aldabra Atoll, a UNESCO World Heritage Site, from fishing, oil exploration, and commercial development. The debt-for-nature deal was brokered by NatureVest, the conservation investing unit of the US-based The Nature Conservancy. As part of the plan, the group will purchase up to $21.6 million of the nation’s over $400 million debt at a discount, and will redirect the payments from creditors to a newly-created local trust. The trust will then use the payments to repay the initial capital raised and also fund marine conversation plans. These will include restoring coral reef and mangrove restoration, improving sustainable tourism and fisheries, and balancing the country’s conservation and climate change adaptation goals with their development needs. Endowed with picturesque beaches, the East African archipelago of just 94,000 people is a global biodiversity hotspot. It relies mainly on tourism and fisheries for economic growth, with fish products making up 96% of the total value of domestic exports, according to the World Bank. But in recent years, the nation has battled severe storms and rising sea levels, while warming ocean temperatures have caused a decline in fish stocks. In 2008, it also experienced a financial crisis brought on by years of unsustainable borrowing and compounded by the worldwide financial crisis. Since then, the government has embarked on a number of projects aimed at sustainable development and tackling the threats of climate change. This year, it emerged as the country with the highest improvement in the Environmental Performance Index due to its dedication to combating greenhouse gas emissions. And authorities aren’t stopping just yet: by 2020, when the conservation plan is set to complete, Seychelles will have protected more than 400,000 sq km of its ocean—an area larger than Germany.